Visual Studio 2017, Visual Studio 2019 Preview and .NET framework 4.7.2 support is available now. All product examples were thoroughly tested under the new development platform. Addressed various issues in examples/samples projects. Now all our samples are correctly built in all supported Visual Studio/.NET versions and configurations. 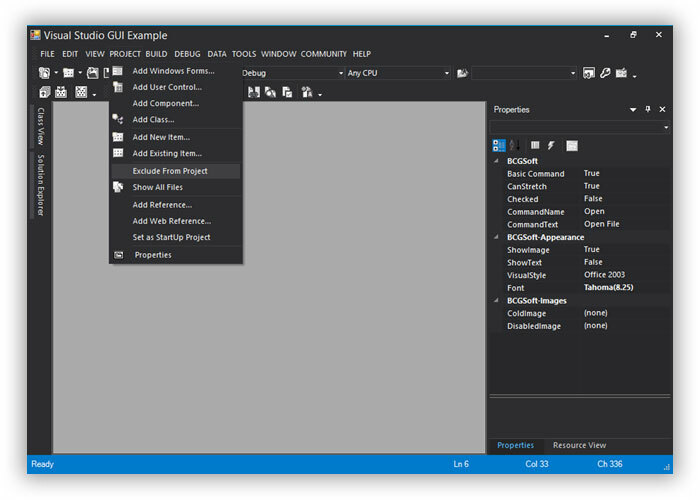 Visual Studio 2013/2015 and .NET framework 4.6 support is available now. All product examples were thoroughly tested under the new development platform. The product is fully compatible with a final version of Windows 10. All product functionalities were thoroughly tested under latest release. Colorful theme (see screenshot). The application frame and Ribbon bar top area are rendered using the accent color. Dark Gray theme (see screenshot). The most application colors are dark gray and accent color is being used very rarely. White theme. 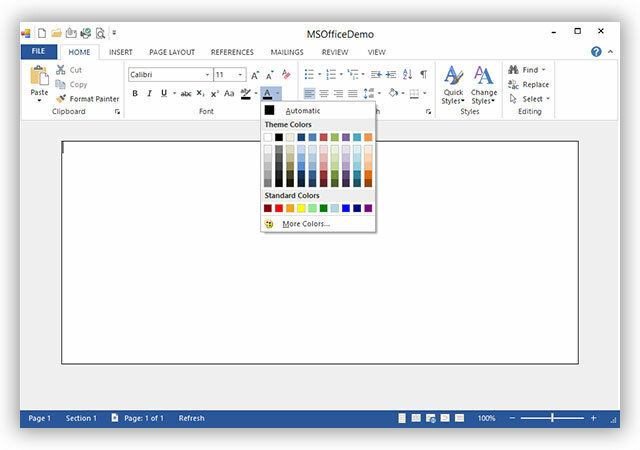 This theme is very similar to Office 2013 white theme. In the Colorful and Dark Gray themes, icons of controls located on the Ribbon QAT or Ribbon tabs area are automatically converted to the simplified (white) icons. 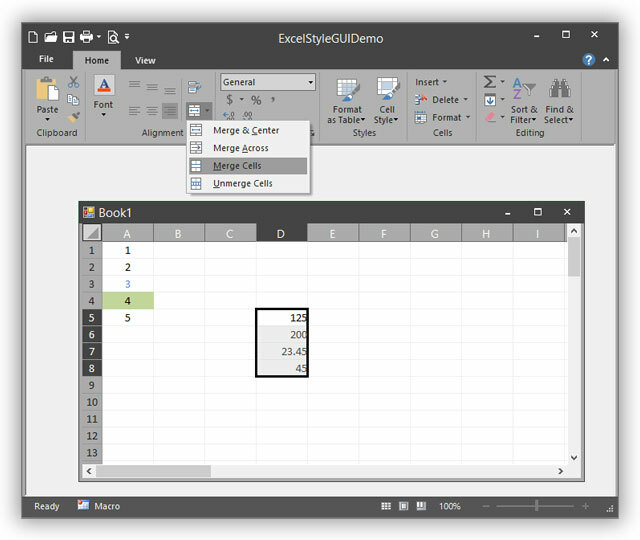 Please take a look at MSOfficeDemo, ExcelStyleGUIDemo and VSStyle_GUI examples to see this new visual theme. Icons within samples and within the library were updated in order to match the modern look. 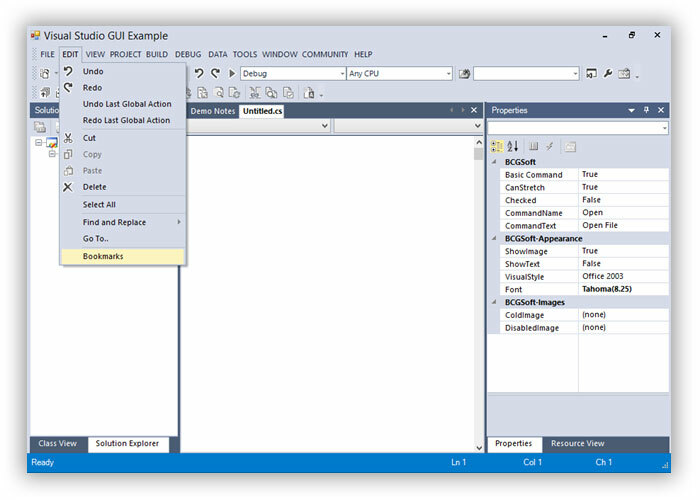 All samples and source projects provide solutions for Microsoft Visual Studio 2015. Improved tooltip visualization support. Implemented ability to use current visual style tooltips. New static methods ToolTipEx::ApplyCurrentVisualStyleToolTipParams and ToolTipEx::GetCurrentVisualStyleToolTipParams were added. In addition, VisualManager class has a new method 'GetToolTipColors'. DockingPanes: improved splitter control painting on dragging. Added new class TrackControl. 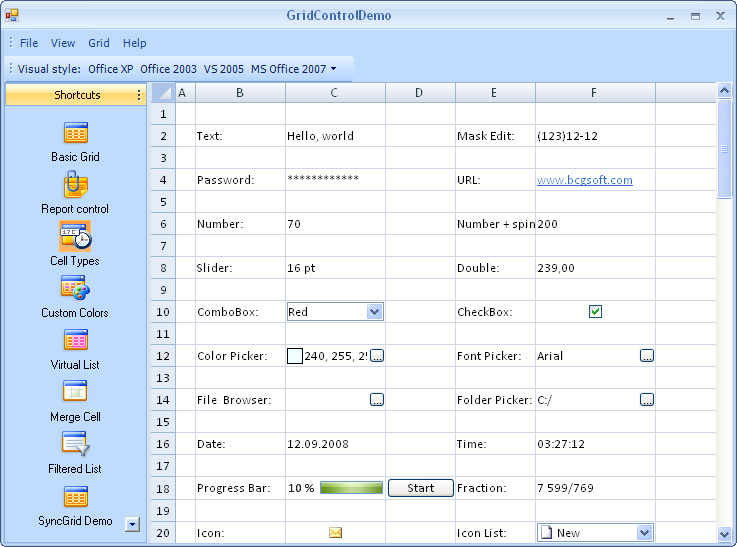 GridControl: added ability to specify a single row selection. 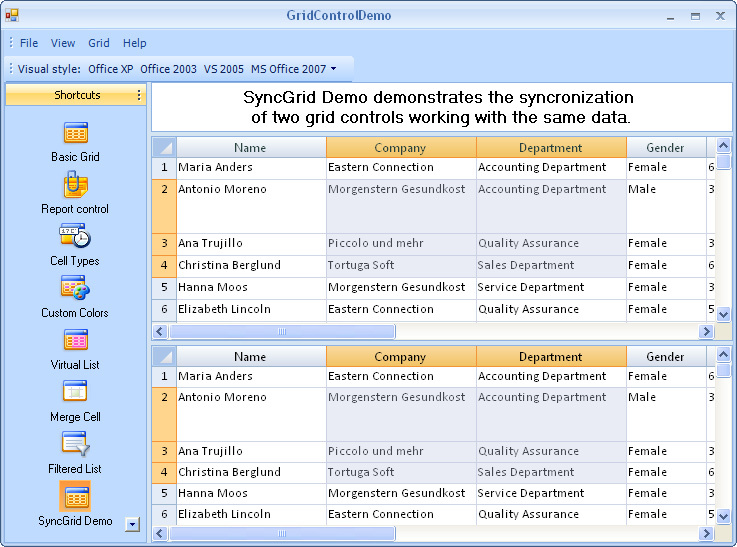 A new property was added GridControl:: SingleRowSelection. TabStrip control: added ability to show/hide left and/or right images. New properties were added: ShowLeftImages, ShowRightImages. The product documentation is fully revised now: all help files are located at our new Help site: http://help.bcgsoft.com/ . You are still able to download .CHM files to read the documentation offline. 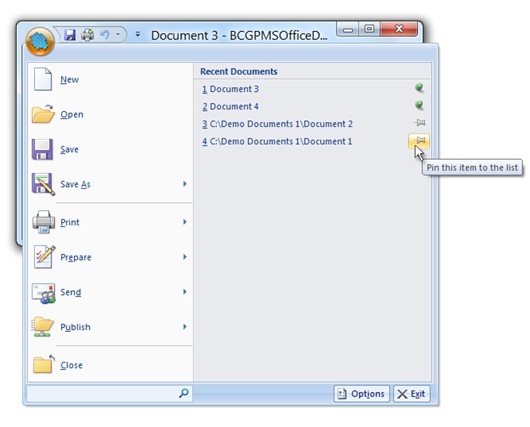 Ribbon Bar in Office 2010 theme: fixed bug with switching tabs in Backstage view mode. Ribbon Bar: fixed bug with dragging main window by ribbon tabs area. Examples: improved look and behavior in different DPIs. ToolbarComboBoxButton: a default width of dropdown list is correctly calculated now. SmartComboBoxButton: fixed bug with painting disabled combo box button. Improved method GlobalVisualSettings::Scale to scale objects properly in different DPIs. Improved method GlobalUtils::GetBorderSize to get border size of the form. A new method was added GlobalUtils::GetSystemBorders. TrackBarEx: fixed bug with transparent painting. A new property was added UseParentBackColor. Ribbon edit control: fixed bug with moving cursor left or right. Improved GalleryControl painting. A new method was added VisualManager::GetGalleryCommandObjectTextColor. DockingPanes: fixed bug with painting color of target docking rectangle. A new method was added VisualManager::GetPlaceMarkerFormColor. DockingPanes: method VisualManager::OnDrawControlBarCaptionText is using now to draw caption text. Added support for Visual Studio 2012 and .NET framework 4.5. All product examples were thoroughly tested under the new development platform. 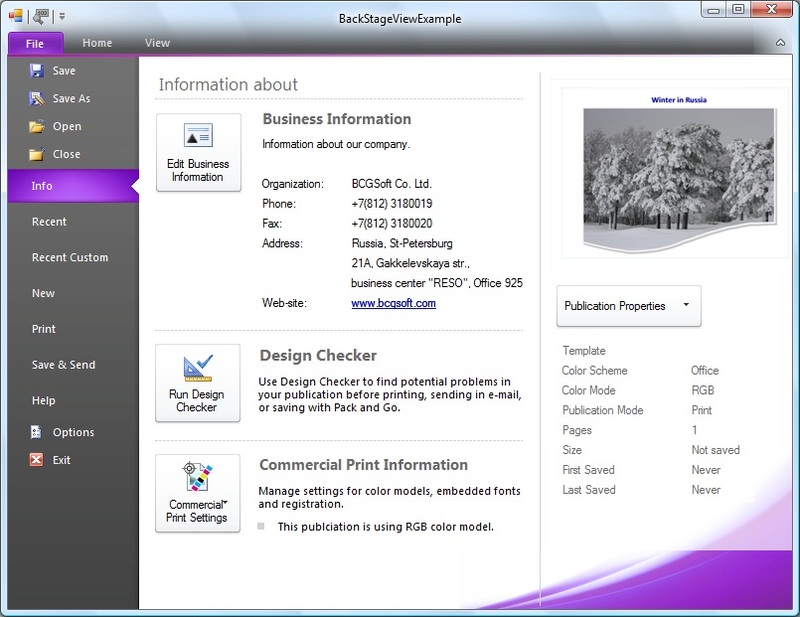 The product Help file is compatible with Visual Studio 2012 Help System (MS Help Viewer 2.0) now. The product is fully tested under Windows 8 release. 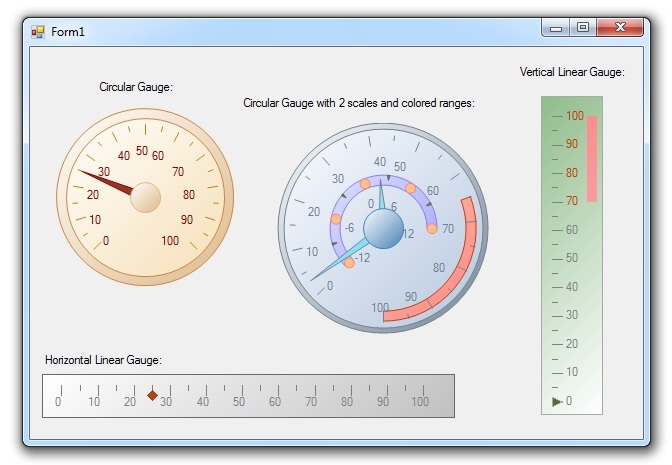 Please take a look at the new example GaugesDemo to see the gauges in action. Class SortableItem is public now. GridDataItem has a new property Tag. You can use this property to save an user-defined data. PropertyList control has a new property DescriptionWrap . Set this property to true if you need to wrap a text in the property list description area. All samples and source projects have solutions for Microsoft Visual Studio 2012. Fixed some problems with GridControl tooltips. Fixed some problems with scrolling in the GridControl. Fixed problem with resizing columns in the GridControl. Fixed problem with hiding controls in backstage view mode. Fixed problem with closing dialogs if backstage view control exist. Fixed problem with EndEditByTab method in ToolbarFocusableButton class. Fixed problem with showing/hiding the DockingPanes. Fixed problem with tab selection in BasicMDITabs mode if MDI child was activated from Windows menu. Fixed problem with painting PropertyList description in Wrap mode. 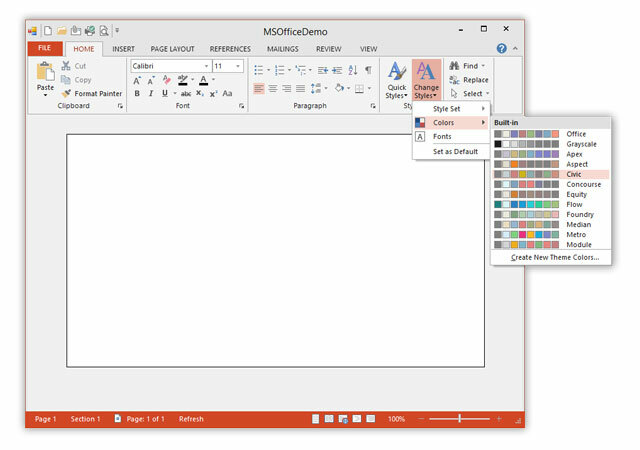 Fixed problems with painting caption buttons on RibbonControl in office 2010 style. Fixed problem with providing temporary VisualManager for office 2010 style. Support for Visual Studio 2010 with SP1. 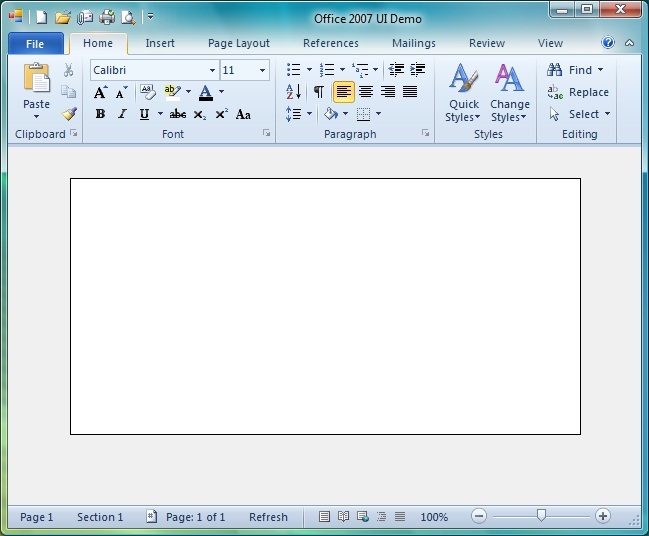 Implemented new visual style: Microsoft Office 2010 style (see screenshot). Implemented BackstageView control and supported controls (see screenshot1 and screenshot2). 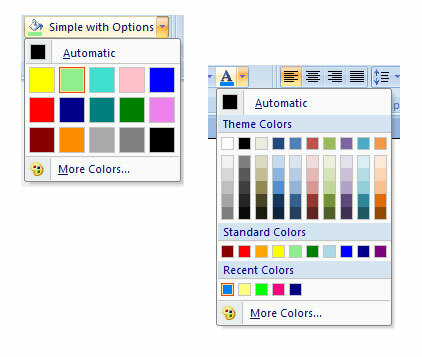 You can use this control in various applications in conjunction with the RibbonControl and Microsoft Office 2010 style. Full designer support has been added as well. Added "Basic MDI Tabs" feature. You can use this feature if you want to provide MDI Tabs control along with the ability to arrange MDI child windows within the client area. MdiTabsOptions component has a new property TabsMode . You can use this property to enable either standard "MDI Tabs" or "Basic MDI Tabs" without any additional code. CommandBarManager has a new property CanShowNewToolbars . You can set this property to true if you want to display newly created toolbars regardless of loaded state from xml file. 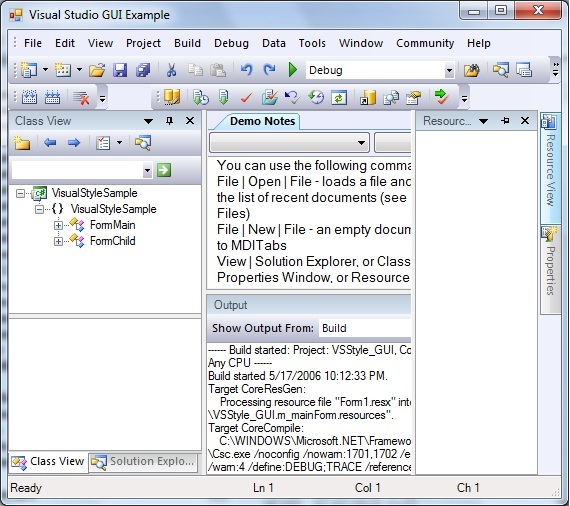 All samples and source projects provide solutions for Microsoft Visual Studio 2010. BackStageViewExample - illustrates BackStage View. 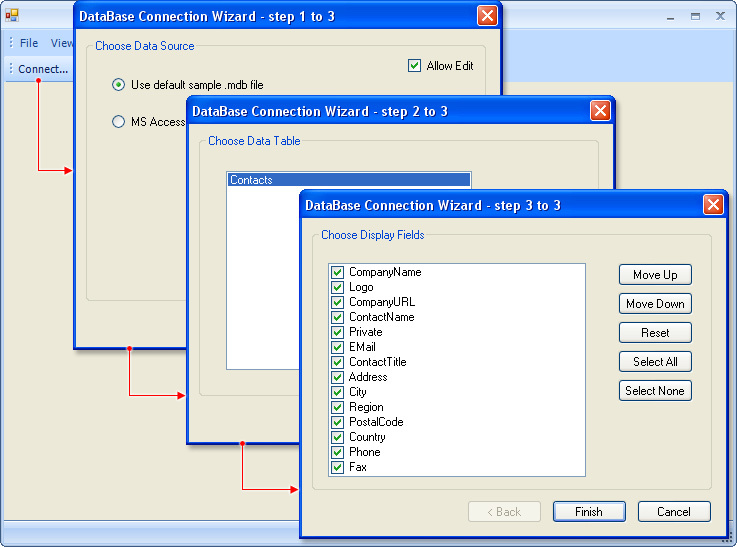 BasicMDITabsDemo - illustrates the new MDITabs feature. 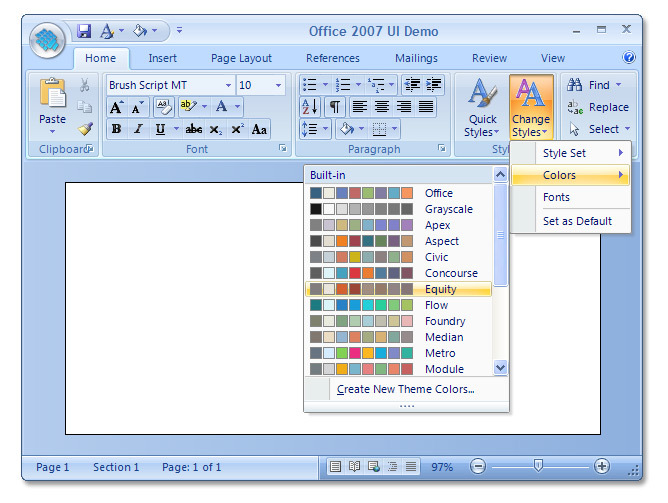 MSOffice2007Sample example has been modified to illustrate Microsoft Office 2010 styles. Fixed some problems with mouse wheel handling in RibbonControl on 64-bit systems. A few hardcoded strings are localizable now. Fixed some misprints within localizable strings. Fixed a design-time problem with RibbonControl - now it shows correct style on opening designer. Fixed a problem with tooltips location and minimized RibbonControl location on mutli-monitor systems. Fixed some serialization problems - a maximized window is restored properly now. Fixed problems with painting text on "glass". ToolbarGalleryButton and ToolbarLinkLabel classes have been marked a serializable. Fixed design-time issues with "RibbonCommands" editor. Now it displays only design-time components. Implemented MiniToolbar ("floaty") (see screenshot). You can use this control in various applications in conjunction with the RibbonControl. Full designer support has been added as well. 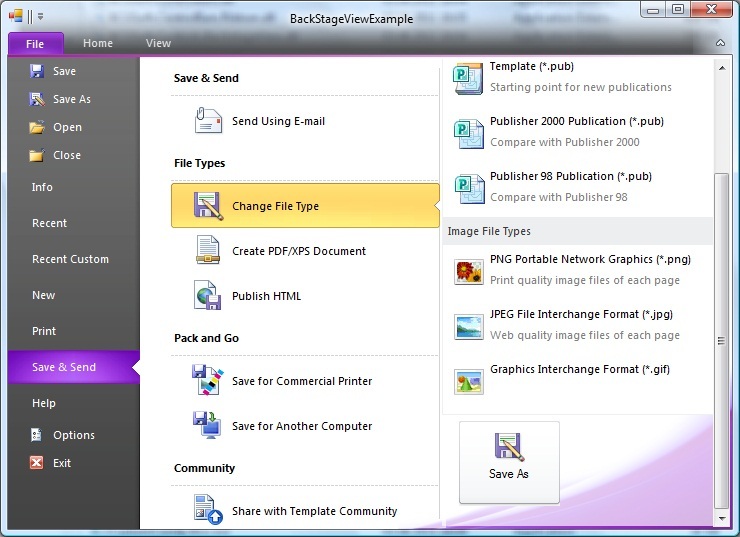 Two new visual styles have been added: Visual Studio 2008 and Carbon (see screenshot1 and screenshot2). Implemented "tab close button" feature. When this feature is enabled a close button appears on each tab of TabStrip control. TabStrip control has new property EnableTabCloseButton . MdiTabsOptions component has new property EnableTabCloseButton. MdiContainer control has two new events MdiTabClosing and MdiTabClosed . Subscribe to these events to customize process of MDI tab closing. Implemented "new tab" feature. When this feature is enabled an additional dummy tab is displayed at the end of tab array. You can click this tab to display a new tab with some custom context. TabStrip control has new property EnableNewTab . MdiTabsOptions component has new property EnableNewTab. MainRibbonButton has new property CustomRightPanel. You can assign a Panel control to this property to display a custom embedded panel instead of the standard RecentDocuments area. RibbonControl has new property CanCustomizeShortcuts . You can set this property to "false" if you want to hide the "Keyboard shortcut" label and the "Customize" button on the RibbonCustomizeForm . Activation of a tab on right mouse click is optional now. TabStrip control has new property ActivateTabOnRightClick . MdiTabsOptions component has new property ActivateTabOnRightClick. Fixed problem with disabled images for menu buttons in MainRibbonPanel . Fixed some painting problems in MainRibbonPanel without "Recent Documents" area. Fixed problem with the drawing of the form caption under Windows XP in Ribbon-based applications. Fixed problem with updating of AutoHideButton. Fixed problem with drawing of Customize caption button in Toolbar control after changing VisualManager. Fixed problem with clicks on RecentDocument items in MainRibbonPanel . RecentDocument items no longer added to QAT. Fixed problem with context menus, which were not closed in Ribbon-based application when a Dialog window was invoked. Fixed problem with wrong toolbar location in float mode when clicking on any Focusable Control (ToolabrComboboxButton, ToolbarEditboxButton etc). PropertyListControl redraws properly when resizing description area. Fixed problem with disabled item painting in the MenuStripRendererEx class. Fixed some design-time problems with adding and removing "Options" buttons to MainRibbonPanel. Fixed a design-time problem with Context Menu - now it is closed when selection has changed. Fixed a design-time problem with selection of non-designable controls in Properties window. Fixed a problem with painting of GroupBox area in GridControl. Design-time: Some images for standard toolbar buttons have been updated. Design-time: fixed crash on removing Ribbon control with Delete key. Popup menus are not closed now on mouse wheel. 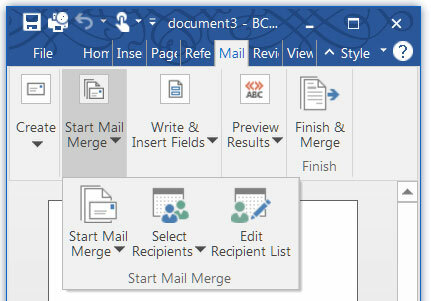 Outlook correctly works when items are added and removed with "Show Fewer/Show More Buttons". Now an application can be closed on double click on the main ribbon button. DefaultRowHeight in Grid control was zero if application didn't use other library components. As a result Grid control didn't display any data at design and run times. Implemented High DPI support (see screenshot ). All toolbar buttons now have High DPI image properties, which allow to specify special high resolution images for High DPI mode. You can also explicitly specify when these images should be used (see HdpiImageMode property). CommandBarManager has new property DisplayHDPIImages . You can set this property to true at runtime in order to allow all buttons display their High DPI images. CommandBarManager provides two new methods: LoadStateFroFile/SaveStateToFile , which allow to load/save state from/to any file. Grid control raises new event CalcExpandBoxRect, which allows to specify custom expand box rectangle (for group mode). DockingPane has a new property DisplayCaption. You can set this property to false in order to hide a docking caption dynamically without changing its height. Popup menu shadows implemented using layered windows. 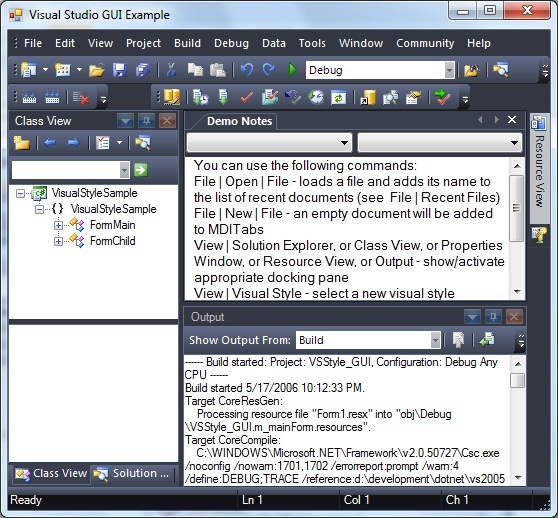 All samples and source projects provide solutions for Visual Studio 2008. Fixed problem with disabled PropertyListColorItem. Fixed problems with licenses on 64-bit systems. Resolved a problem related to double click on RibbonContextGroup. A few hardcoded strings in OutlookBar control are localizable now. Fixed a problem with placing TaskPane control on the standard user control. 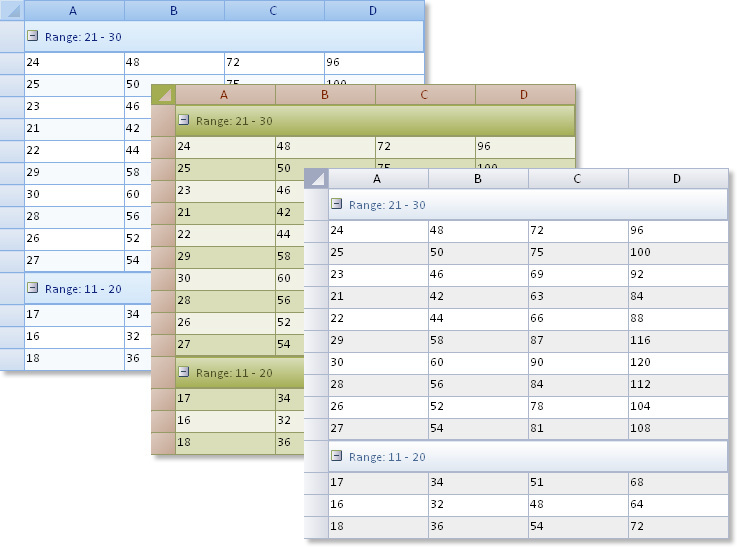 Fixed a problem with generation of dummy panels in TabControlEx in design mode. WindowState property now takes effect for Ribbon-based applications. Right mouse click on splitter doesn't change size of docking panes. Pressing Alt key doesn't move focus away from the current edit in Ribbon-based applications. It makes possible to type extended symbols using Alt+Num pad. A Combo box located on a toolbar can't be resized during Alt customization. Capturing is properly cleared on mouse click when a menu was activated with Alt key. MDI system buttons can be added to QAT. Keytips are properly hidden when a modal dialog is invoked. Keytips are drawn as disabled on disabled popup menu items. Navigation Pane Options dialog (for Outlook control) is not displayed on taskbar anymore. Items on Navigation Pane Options dialog can be checked and unchecked by single click. Menu is not closed anymore when you press enter on disabled menu item. Text of disabled check box and combo box is drawn as disabled on QAT. When you place standard buttons on a toolbar in design mode, they are inserted in correct order now. Top level menu is properly redrawn when you open a modal dialog from a sub-menu. Fixed some problems with scrolling of OutlookBar control. Hyperlink cell opens a destination site if clicked when Ctrl key is down (for non-read only items). Resizing of popup galleries is not interrupted if you click right mouse button during resize. Resizing of docking panes is not interrupted if you click right mouse button during resize. Main window caption text does not overlap system buttons and context categories in Ribbon-based applications when Aero-theme is enabled. Main Ribbon button doesn't stay highlighted when you open a modal dialog from the main panel. Submenu doesn't flicker when it's opened from a split button on the main ribbon panel. Fixed some other visual problems. Grid Control. 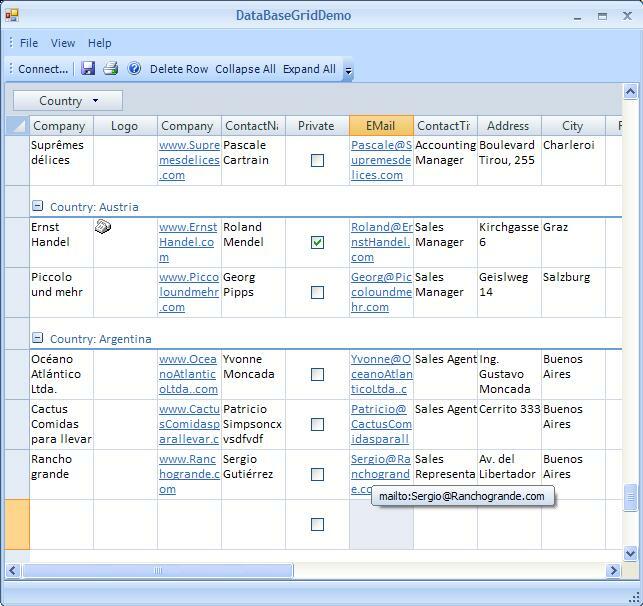 You can use this advanced grid control in various applications, ranging from basic grids and simple reports up to complex Excel-like applications. Unlimited number of items in a row. Single and multiple row selection. Single and multiple column selection. Single and multiple item selection. Sorting by single or multiple columns. Drag and drop of columns. Row resizing - variable row height. Row headers with or without row numbers. Ability to set number of rows in advance. Events requesting data only when the data has to be displayed. Ability to define Visual Styles for individual cells in virtual mode. Drag and drop of column headers to Group By box. Show or hide Group By box. Ability to display "new row" in Group mode. Ability to delete a group with all sub-rows. Single filter mode - filter flag is set at the row level. Multiple Filter mode - filter flag is set at item level. Ability to hide filtered out rows. Ability to set height to 0 for filtered out rows. 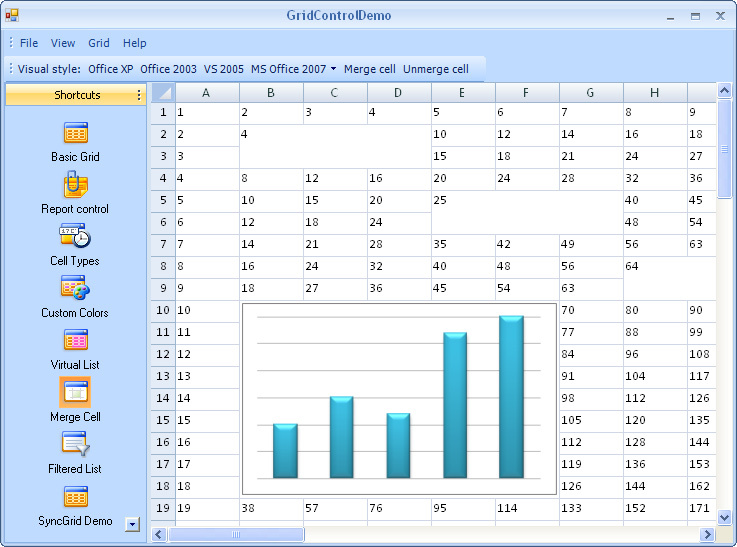 Ability to combine data bound and unbound columns in one grid. 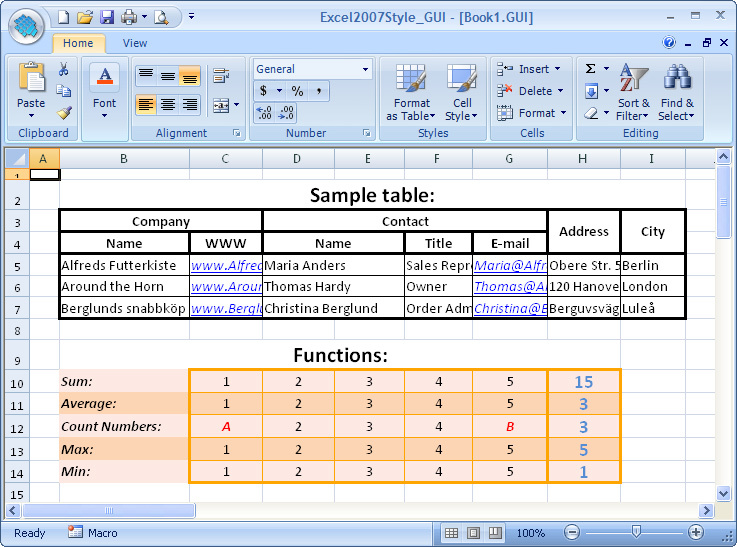 Grouping support for data bound grids (see screenshot). Support for custom color themes (see screenshot). Special visual style for alternative rows. 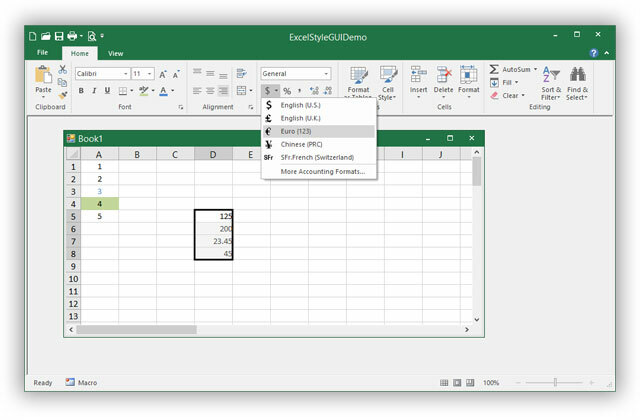 Authentic Excel look and feel. Automatically generated rows and columns. Load and Save grid content (data). Sorting by moving data between rows. Cell borders - thick and thin borders with different line styles. Text over floating - text is drawn over adjoining cells if they are empty. Edit control is extended over adjoining cells as you type. Ability to define Visual Styles for individual cells. A Visual Style includes: gradient background color, text color, font, formatter, border style, content alignment and more. 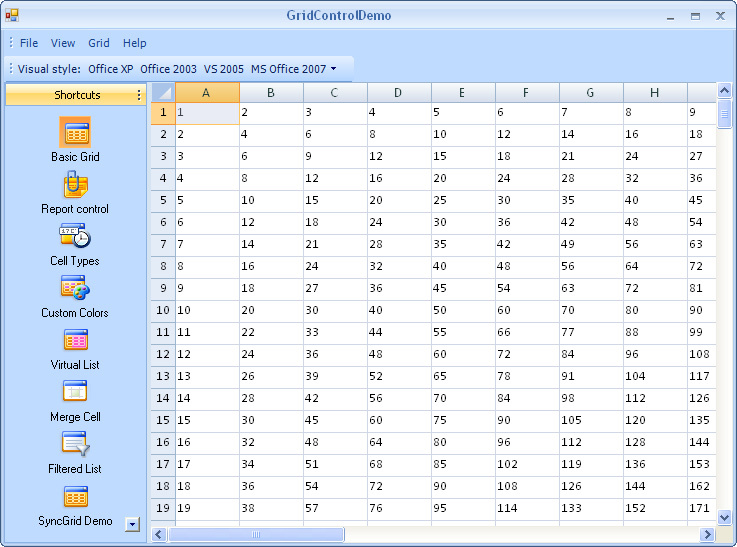 Ability to assign one data storage to several grids (see screenshot ). Events allowing to synchronize grids working with the same data. Visual Style Editor, which allows to Save and Load visual themes. Layered architecture - visual styles of all cells are assembled from Visual Styles assigned to item->column->row. Large number of customization features and options. Vista Aero glass support for Ribbon control (see screenshot). 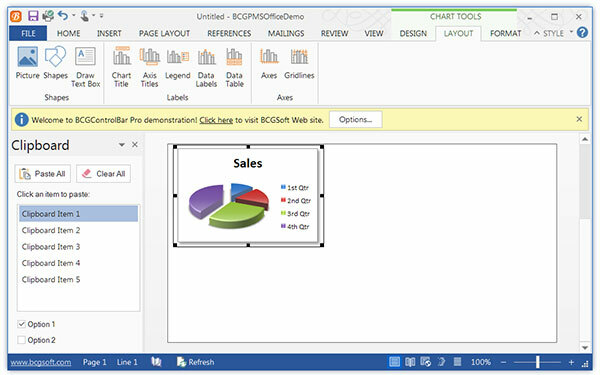 Added new property AutoGroup to BCGSoft.ControlBars.CommandBarManager . If this property is true, customization groups are created automatically from the main menu items. Added some fixes for Ribbon Control and Command Bars in design and runtime modes. Add and edit ToolboxGroups and ToolboxItems with full design-time support. 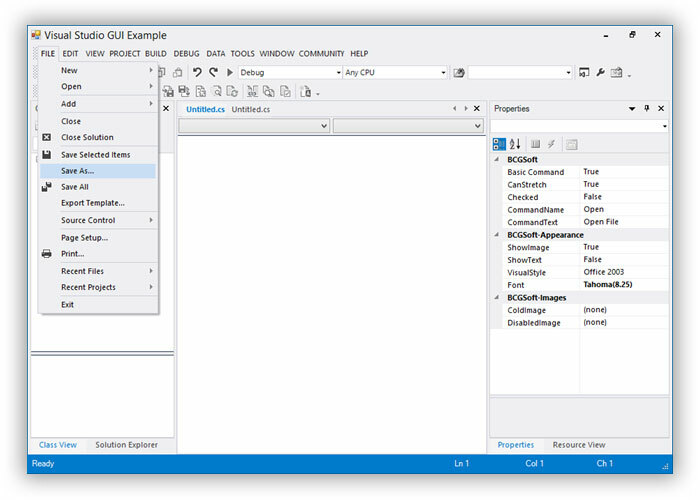 Switch between Microsoft Visual Studio 2003 and Visual Studio 2005 styles at the runtime. 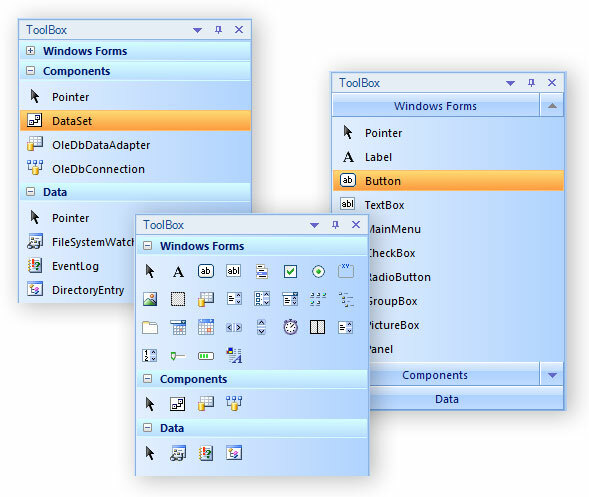 Drag & drop toolbox items within groups, between groups or outside of the Toolbox. Set palette mode (toolbox items aligned by line and displayed without text) individually for each group. Adjust item's icon and text location. Manage groups and items at run-time. Use global or local Visual Manager. "More Colors" button, which displays an advanced color selection dialog. "Recent Colors" palette, which can be modified at the runtime. Ability to assign custom colors to any color category (theme, recent, simple). Content can be created from an user-defined resources or it can be automatically generated from the given text and image. 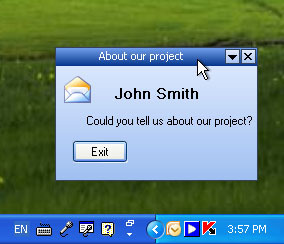 Various looks: Office XP/2003/2007, MSN Messenger (see screenshot). Various animation types: fade, slide and unfold. LinkLabel - an URL link which can be placed on the Ribbon or toolbar (see screenshot). SmartUndoButton - a button, which maintains a stack of values. Can be used for undo/redo interface (see screenshot). ToolbarSpinButton - represents an edit control with spin (up and down) buttons, which allow to increment or decrement value in the edit control (see screenshot). 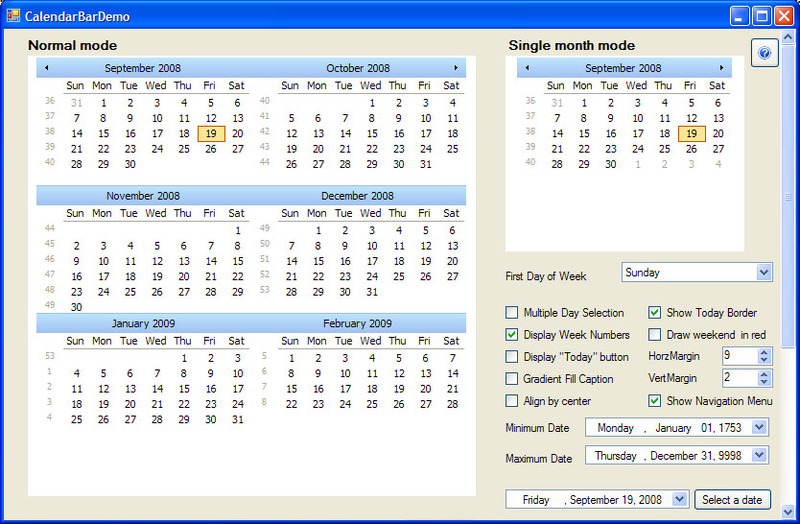 ToolbarDateTimeControl - a button that hosts a date-time control (see screenshot). ToolbarTrackBarButton - a button that hosts a track bar control (see screenshot). ToolbarProgressBarButton - a button that hosts a progress bar (see screenshot). The new method DockingPane.SetRecentFloatingSize allows to specify the initial size of floating docking pane (or reset this size to desired dimensions). The new property CommandBar.CanFloat allows to enable or disable floating of command bars. The new property CommandBar.CanTrack allows to enable or disables tracking of command bars (so if you set CanTrack and CanFloat properties to false a command bar will be completely locked on its site). 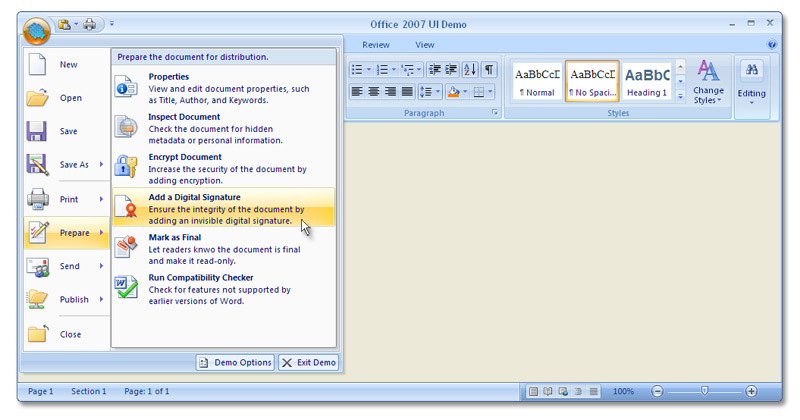 "Recent documents" collection is automatically serialized and de-serialized for Ribbon-based applications. Added new class RecentlyUsedDocumentButton, which wraps the data provided for recently used documents. ExecuteCommandEventArgs contains a reference to such button and thus you can easily determine that the ExecuteCommand event raised in response to user selection of a recent document. 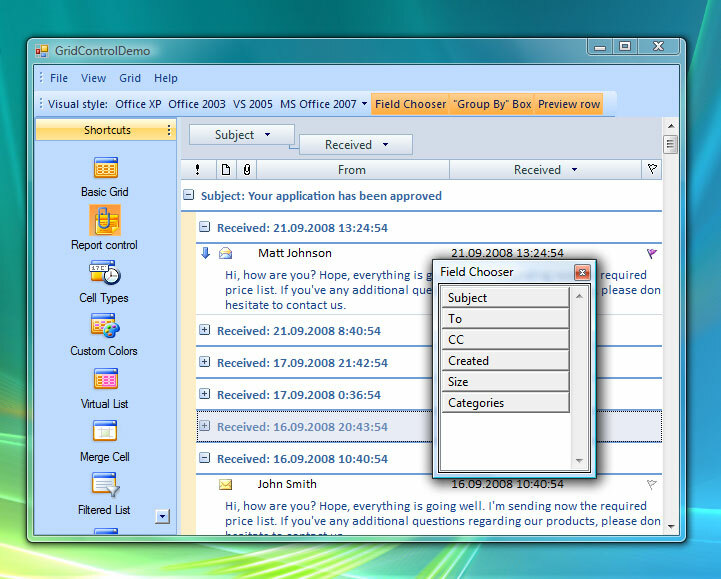 See our MSOffice2007Sample for more info. PopupDemo - demonstrates the DesktopAlert Control. RibbonGadgets - a comprehensive sample with all available Ribbon gadgets. SmartUndoButtonDemo - illustrates usage of the newly added Undo button. ToolboxDemo - demonstrates the Toolbox Control . Fixed some problems with layout recalculation in design mode. Fixed some problems related to collection editing via Custom Collection Editors in design mode. MinimumSize and MaximumSize properties now take effect in Office 2007 style. Form's size correctly calculated in maximized state when Office 2007 style is selected and there is a visible Task Bar on the desktop. 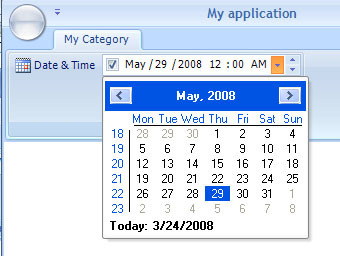 Main Form doesn't lose the focus when Visual Manager 2007 is activated or deactivated. 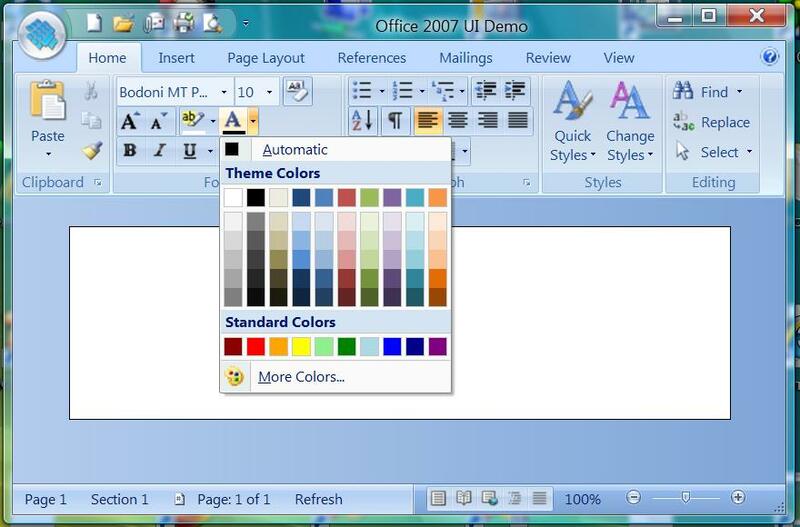 In Office 2007 style the library correctly hides minimize and maximize buttons if you set in the designer MinimizeBox and MaximizeBox properties to false. It's possible to assign .ico images to toolbar buttons. MainRibbonButoon correctly handles transparent color specified for its image. Some other visual glitches and problems have been corrected. 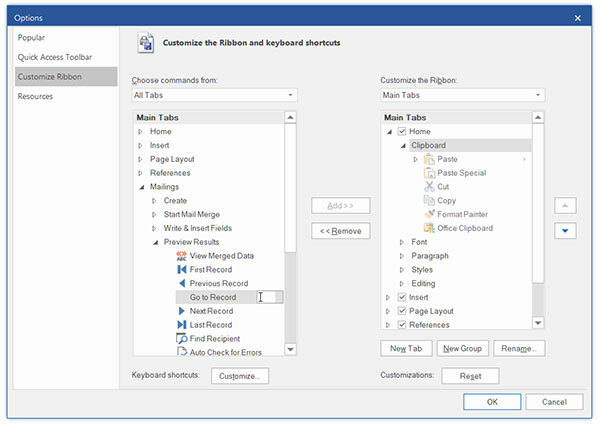 TasksPane Control (see screenshot ) implements the functionality of a list of clickable items, similar to Microsoft Office Task Pane. All items are organized in groups. Each clickable item raises the ExecuteCommand event. You should subscribe to this event to handle item clicks. It's possible to assign an icon to a task and set static label text. 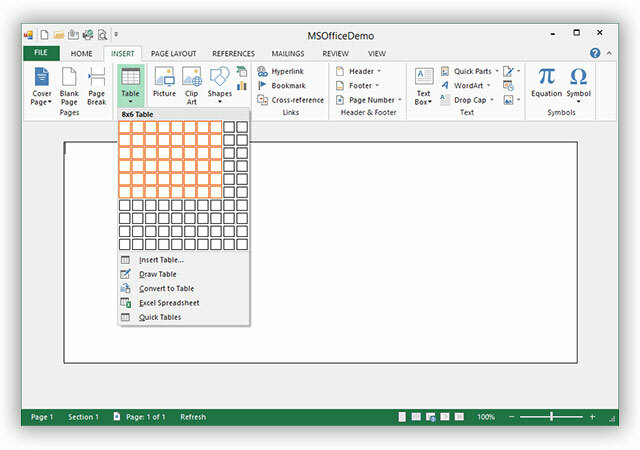 Please take a look at the WordPad and TasksPane samples to see the new control in action. Ability to enable, or disable collapsing Task Pane groups. KeyTip support for Ribbon Control. Progress Bar Control, which supports Office 2007 look. Progress Bar button for Ribbon Control. DockManager raises a new cancelable event CloseDockingPane. You can subscribe to this event to be notified when a Docking Pane is about to be closed. ToolbarButton has a new virtual method GetKeyTipRect. It can be overridden to customize the appearance of Key Tip. ToolbarButton has two new properties KeyTip and KeyTipSplit. You can use these properties to define Key Tips for Ribbon applications. The infrastructure for Ribbon Control has been updated to accommodate Minimize Ribbon and Key Tips features. Fixed a problem with context menu, which caused a crash on Escape in Ribbon-based applications. Fixed behavior of category items in popup mode. Layout is properly adjusted when user preferences have been changed. Text of localized controls is correctly restored on LoadState. In the previous version only English strings were loaded properly. CommandBarManager::OnApplicationIdle does not call GC::Collect anymore. Popup Gallery does not process Enter key if there is no highlighted object. ToolbarGalleryButton correctly copies SelectedItemIndex now. Check state of ToolbarCheckBoxButton is changed only if the button is enabled. Ribbon Control support (see screenshot1 and screenshot2 ). 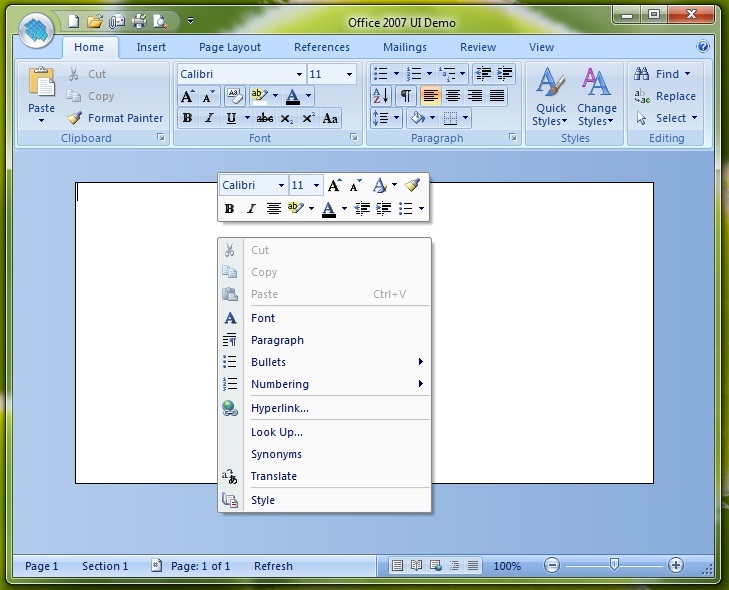 "Ribbon" control was introduced by Microsoft in Office 2007. It's not just a new control - it's a new user interface ideology. 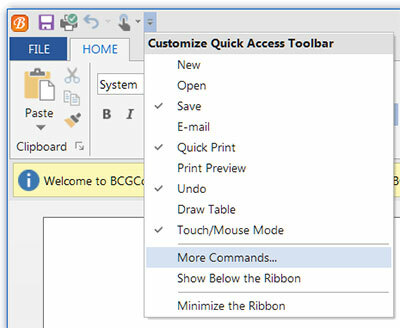 Ribbon control replaces traditional toolbars and menus with tabbed groups (Categories). Each group is logically split into Panels and each panel may contain various controls and command buttons. In addition, Ribbon control provides smart layout maximally utilizing the available space. For example, if a Panel has been stretched and has no place to display all available controls, it turns into a menu button which can display sub-items on a popup menu. Please take a look at Product Feature Tour to learn more about what's implemented in Ribbon Control. Full Microsoft Visual Studio 2005 designer support! Each ribbon element (button) supports three collapse states: Large, Intermediate and Small. Collapsible category items. When there is no space to display all panel elements, the panel is collapsed to a default button and displayed on popup menu (see screenshot ). Scrollable categories. When there is no space to display all category items in collapsed state, the parent category displays scroll bars. Context category groups. Each context category group may contain of one or more category items and may be assigned one of 8 predefined colors (see screenshot ). Quick Access Toolbar (QAT) (see screenshot ). You can place frequently used commands on QAT. It is possible to put on QAT commands that are not located in Ribbon. QAT Customization. A flexible mechanism allows you to integrate your own forms (options) with library-defined Customization form and show them all together in combined Options dialog (see screenshot ). Launch buttons - small elements that can be added at the right bottom corner of a category item and may be set to execute commands logically common for the parent category item. Gallery control. Gallery is encapsulated in a special toolbar button-derived object. A gallery may be in-Ribbon and popup. Popup menu can display a gallery along with regular popup menu items. A popup menu, which displays a gallery may be resizable (see screenshots ). Gallery may work in so called "menu mode". Galleries behave in "menu mode" like regular popup menus with exception that such popup menu can be resized, can display scroll bar and can display checked items. You can easily create owner-draw galleries. Main Application Button (see screenshot ). Customizable status bar (see screenshots ). You can translate the library and your applications to different languages and switch between them at runtime. Please see the LocalizationExample sample for more info. We added a lot of new samples illustrating various library features. The library infrastructure has been changed to accommodate the new Ribbon interface. CommandPanel and any other control derived from it can work in "component mode". In the "component mode" the panel itself is not visible and renders its command objects on the parent container's surface. Docking pane correctly updates its caption in various states (docked, floating, tabbed, auto-hide) when the Text property has been changed. License manager checks the license properly when the library is running under system account. Various fixes that improve design-time experience.